When hunting small game you basically have three choices when it comes to transporting your kill; a game bag attached to the back of a vest, a noose carrier that you attach to your belt or drape over your shoulder, or you can just carry your kills in your hand. I personally don't care for the game bags attached to a vest. They get hot and do not cool your kill well. They are also a mess, getting full of blood and feathers. I find that carrying kills in my hand is both impractical and gross. So, that leaves the noose Carrier. Some have nooses that pull tight around the neck of your kill, others use a wire slot which allow you to carry quite a few animals at a time. You can buy these for cheap, but I prefer to make my own. Divide the 12 foot section in half﻿, tying a string about twelve inches from the top of the loop. The next few steps are easy to do, but hard to describe. I'm just going to let the pictures do the talking. My camera was out of focus the first time I did this step, this is actually the on the second knot. If that did not make sense (which I can understand) here is a video I made showing how to make a survival bracelet. The knot is the same. Until there is only a quarter inch of loop left. And tie a double knot. 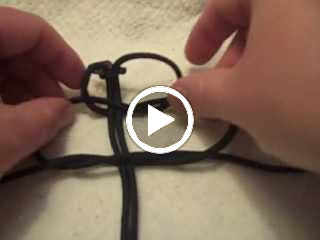 Cut the extra strands close to the knot. Burn the ends. This keeps the cord from unraveling and the knot from untying. Pull the 18 inch strands through the loops at both ends. One for each end. Tie a slip knot at each end of the 18 inch strands. There you have it! It will hold four animals. Hang it over your belt, and place the loop over your kills head. It works great! I usually keep two in my pocket which allows me to carry 8 of my kills around. Generally, before I run out room I make a trip back to the truck to unload the game into a cooler. This is the best way I have found to transport small game.